- Classic simplicity. Carved soapstone mortar and pestle features a design with timeless appeal. 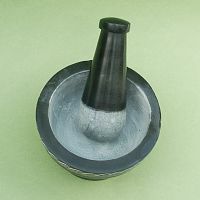 Stands 2 1/2" tall, and measures 4" across. 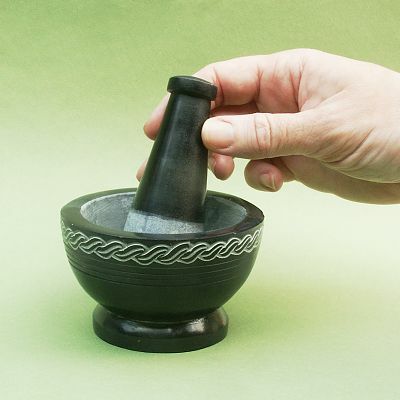 Do you have any other questions about our Celtic Mortar and Pestle? 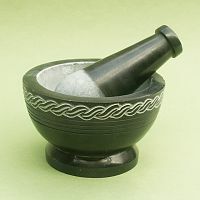 I'm extremely pleased with this Celtic Mortar and Pestle. You can tell right away that it is well crafted and high quality. It's every bit as beautiful as the picture shows. My nephew is studying to be a pharmacist and this will make the perfect gift for him.